Our Process - How We Work - Brick Restoration, Inc.
We believe in full transparency and that problems only arise when expectations differ. Since customer satisfaction is our priority, this page is here to explain the Brick Restoration work flow so you know exactly what to expect should you decide to work with us. We provide a few different ways to schedule your free estimate and consultation. Whether you call, email, or send us an online request we can get you taken care of. Our online request page is great for expediting the appointment process. You can easily upload up to 5 pictures of your repair along with a detailed description. Once we receive your request, either Sheila, Nicole or Diana will promptly reach out to schedule an appointment for an estimate. 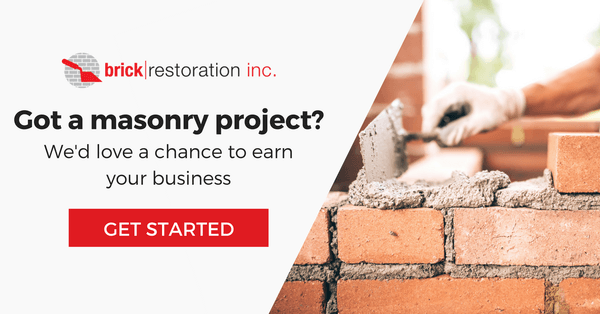 We will coordinate a date and time frame for one of our Restoration Specialist to meet with you and inspect your masonry issues to provide the proposal. We do encourage you to be available to meet with the Restoration Specialist during the consultation. This allows us to fully communicate our suggestions and reduce miscommunication during the project. Don't hesitate to call us no matter how small the job is. We can even help with a single crack! We do have a minimum charge of $280 for any job. However, if you only have a single crack, and you want to go with the experts, our restoration specialists may suggest minor additional work so that you get the best bang for your buck. We have the expertise, man-power and infrastructure to handle large and complex projects too. We are also fully insured and can provide all additional documents needed to hire us. A thorough and detailed proposal, that we can stand behind, takes time to prepare properly. However, we do aim to have the proposals in your hands within 24 hours. Often we are able to provide estimates on the spot depending on the project or repair. Sometimes we can provide you with a proposal without having to wait for an appointment. Mailbox, whether they are repairs or new construction, can usually be priced the same day. We cannot add your project to the schedule until you have reviewed and approved the proposal. Of course, our technicians are always available to answer your questions and address any concerns you may have about the scope of work to be done. Once we have received your approval, we'll begin sourcing any special materials, such as matching bricks that may be needed to complete your projects. Brick Restoration's standards and expertise are in high demand. So in the busy seasons, we may experience some extended wait times. Due to the commitment to our standards and doing every job right, we may be up to 2-3 weeks out before we can begin your project. However, we do understand that sometimes emergencies can happen and you simply cannot wait that long. If this is the case, please give us a call and we'll be more than happy to see if and how we can help. Unfortunately, if you're looking for same-day or next-day brick work, we will most likely not be able to meet your deadline. However, if you're looking for quality workmanship and believe in getting the work done right, then we are a good fit. Many of our jobs actually involve redoing the work of another contractor who was both cheap and fast. It might take up to a few weeks for us to begin the work on your project but we can guarantee that you won't be disappointed.